The nutritional and health benefits of grapefruits can never be overestimated. Taking advantage of this fruit by consuming it regularly will go a long way in maintaining the overall health of your body. Just like most fruits, they are packed with phytonutrients which enriches our body and also serve as means of preventing some sort of infections and diseases. In this post, i will briefly highlight the top 3 of those benefits grapefruits can render to our health. Grapefruit are nutrient-rich foods that are low in calories as well. 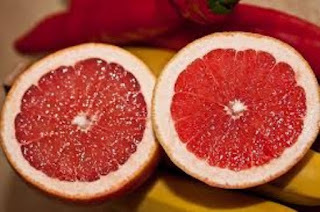 Half a medium size grapefruit contains 52 calories, 13 grams of carbohydrate and 1 gram of protein. Half of a grapefruit gives you 64 per cent of your daily vitamin C requirements, 28 per cent of vitamin A, 2 per cent of calcium and 2 per cent of magnesium. They also contain vitamin E, thiamin, riboflavin, niacin, folate, pantothenic acid, potassium, phosphorus, manganese, zinc and copper. They are rich in antioxidants lycopene and beta-carotene and phytonutrients limonoids and naringenin. Nutrients like fibre, potassium, lycopene, vitamin C and choline are essential for heart health. Research has found that fresh red grapefruit lowers blood lipid levels especially triglycerides, and bad LDL cholesterol. Another study found that a diet high in potassium (found in abundance in grapefruit) lowers risk of death from ischemic heart disease, reduces risk of stroke and lowers blood pressure. The pectin grapefruit slows down the progression of atherosclerosis. The presence of antioxidants like vitamin C, Lycopene and beta-carotene have been shown by research to lower the risk of some cancers. These anti-oxidants prevents cell damage due to free radicals. Phytonutrients called limonoids prevent the formation of tumours by forming glutathione-S-transferase, a detoxifying enzyme. Limonoids fight cancers of the mouth, skin, lung, breast, stomach and colon. The pulp of grapefruit contains glucarate compounds that help prevent breast cancer.